Interacting with the American Muslim Community is a program that I designed, managed and taught. It was a highly successful program that received rave reviews from attendees and was in the news media multiple times. It was approved by two prominent scholars in Houston, the leadership at the Islamic Circle of North America and the Islamic Society of Greater Houston. Houston police officers were invited to attend these monthly Houston Police Academy accredited classes to further department elective ongoing education at the Islamic Dawah Center founded by Houston Rockets basketball star Hakeem Olajuwon in downtown Houston. The video contains two news clips resulting from press releases that I sent out telling about my police department program. The first interview was held a couple months after the success of our pilot program. The pilot was held with members of the Houston community including leaders from the Jewish community, the Houston mayor’s office, the US Department of Justice and many more attending. Shortly after, a second press release was sent and I invited Hakeem Olajuwon to attend to help publicize the program. The interview with Hakeem Olajuwon on Fox News is seen in the second half of the video. 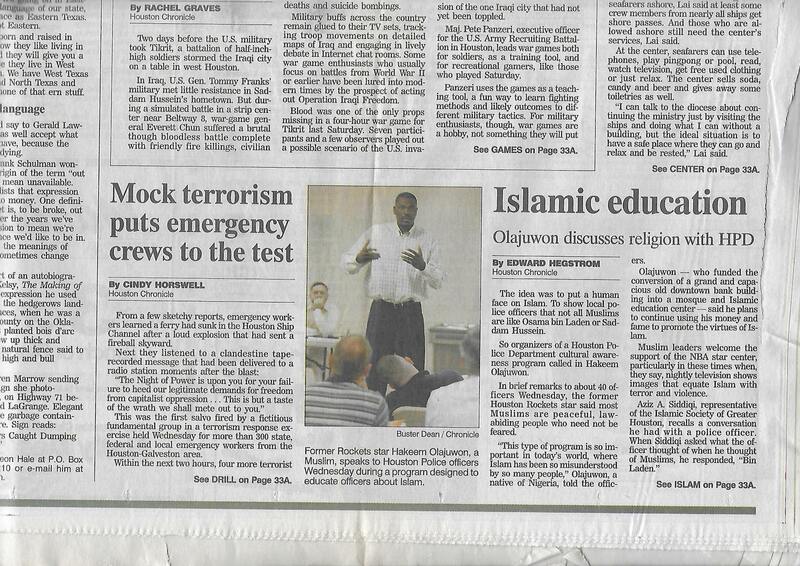 The newspaper clipping below is a second appearance by Hakeem Olajuwan to visit the officers attending the program. 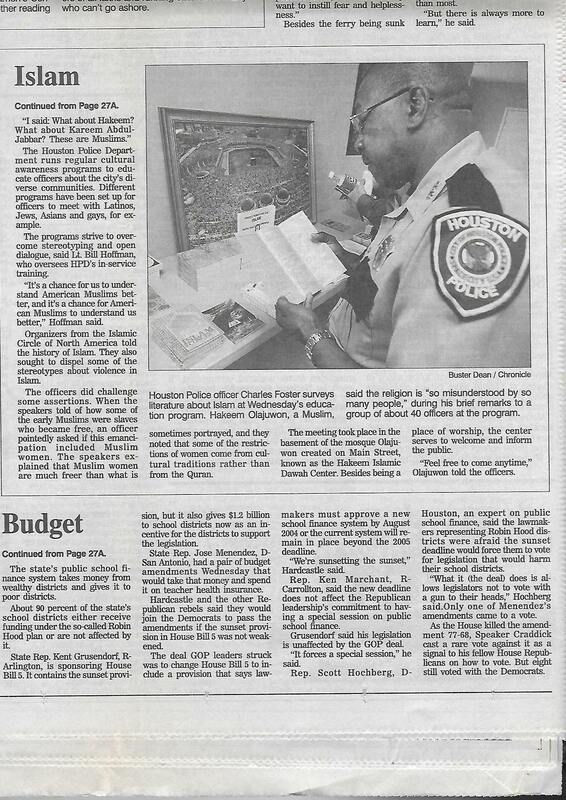 The article below that (Badge & Gun) is one of two articles by the Houston Police Officers Union to discuss the groundbreaking program. Susan Llanes-Myers put into words what every police officer must have figured out a long time ago. Llanes-Myers, the daughter of a Texas Ranger, deals with hate education every workday. She is executive director of the Holocaust Museum Houston, where exhibits and educational programs are dedicated to teaching each visitor how hate can intensify and destroy millions of human beings. The Houston Police Department has been taking a very productive advantage of the Museum’s educational program and continues to use the police-friendly facility to teach officers more and more about hate and hate crimes. Several years ago, the Houston Police Academy’s Bill Hoffman saw the need to develop a partnership with the Holocaust Museum to teach Houston police officers more about hate. He figured, correctly, that officers were open to an off-site location for such an educational opportunity. Llanes-Myers worked with him and the HPD to set up an eight-hour course entitled Hate Crimes and Hate Groups – a Holocaust Perspective. Now the once-a-month elective usually draws a capacity crowd (60 persons). Llanes-Myers is the lead teacher and includes a student session with a Holocaust survivor and concludes with a Museum tour. Adolph Hitler strongly pounded home hate on European soil 60-something years ago. Today, Llanes-Myers contends hate goes a long way and will intensify if more people are not educated on the subject. Her course, for example, produces facts showing that there are at least 3,000 hate sites on the Internet. Hate also is an educational subject that has drawn the intense interest of HPD Officer Steve Smith, assigned to the human relations unit at the Houston Police Academy since 1993. Smith, a primary believer, supporter and encourager in the HPD/Holocaust Museum courses, said the course inspired him to envision a similar concept. Instead of just focusing on educating officers about the Jewish targets of hate over the centuries, Smith successfully sought to set up a course featuring the Muslim community. Muslims everywhere have been targets of hate ever since the tragic events of Sept. 11, 2001. Although Osama Bin Laden’s ruthless band of 5,000 Al-Qaeda followers in no way represent the Muslim faith, sincere believers bore the brunt of often violent and hateful reactions. He contacted the Islamic Circle of North America, a local group, and the Islamic Da’wah and soon got strong support from none other than Houston basketball legend Akeem Olajuwon. The Da’wah is located in an historic bank building in the 200 block of Main Street and receives strong financial backing from Akeem. “Officer Roman Chavez, who works at the academy, told me about Akeem,” Smith said. “I visited with Akeem and asked if he would be interested. He said it would be a great thing to do. He wants to do more education about the Muslim community. Smith also had the support and dedication of Llanes-Myers and the Holocaust Museum, as well as local Muslim spokesman Jim Coates. Coates is a former Baptist Christian married to a woman who has been a Muslim since birth. He reverted to Islam when he met Fatimah Bhutan in his hometown of Chicago and the couple moved to Houston, which had been Fatimah’s home in past years. Coates became a spokesman for the local Muslim community several months after 9/11 when hate crimes against Muslims were rampant because what American society didn’t know was unjustly hurting a religion. He said Houston’s Muslim leaders decided to launch an unprecedented education campaign. Part of the ensuing process included a billboard on the North Freeway advertising a telephone number to call for information about Islam. Smith saw the billboard, called the number and got to know Coates. After meeting with Coates and Llanes-Myers to develop the course, Smith followed their advice. It worked. Today’s story is a success, with HPD developing stronger ties to both communities as well as an improved understanding of the hate crimes that affect them. She and the Museum were gracious about providing start-up help. She monitored the first class in January, led by Coates at Akeem’s Da’wah. Coates, a truck driver for a Houston Chronicle contractor, quickly tried to clarify basic myths. Muslims, for instance, don’t meet in “mosques,” but rather in masjids. By far his highest priority was – and still is – to stress that Osama Bin Laden and his Al-Qaeda followers do not represent the Muslim faith at all but use Muslims to further their terrorist goals. As far as the course, Coates said, “We didn’t want to be teaching religion. 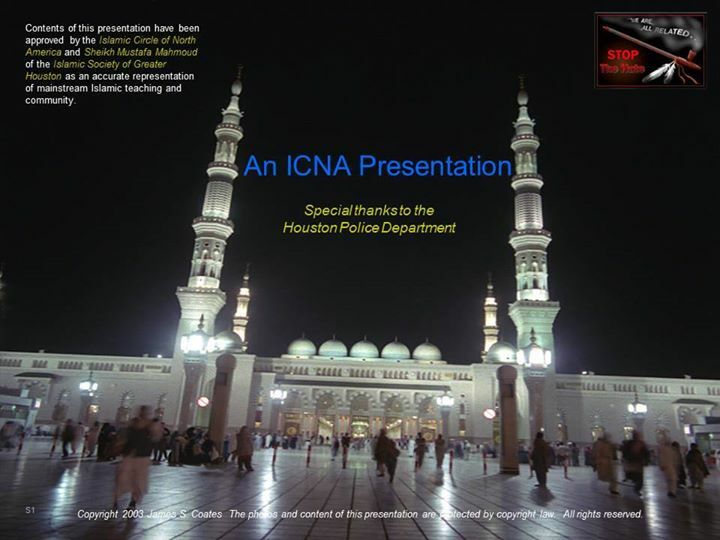 We geared it to teaching law enforcement officers how to react to Muslims and understanding their culture, which is directly linked to their religion. Smith said the course teaches many basic lessons and could provide many suggestions of ways to better deal with the cultural ramifications. Muslims are required to pray at least specified five times every day. They are not always the exact time each and every day. There have been reports of Muslims acting suspiciously, such as kneeling on small carpets in a parking lot near a vehicle – a situation that seems suspicious. They are not planning to bomb a building; they are praying. “HPD must work to have a stronger relationship with the Muslim community,” Smith said. “If Dispatch knows the prayer times, they (dispatchers) will know and the officers will know (the reason for kneeling on carpets in parking lots) and have a better understanding. “As we have classes we’re learning more things that might be of use,” he said. “Muslim communities around the country have undergone great harassment,” he explained. “But here we have had a lot of good support from communities, particularly the Jewish community, and we haven’t had that many hate crimes. “It is very important to get this course up and running at this time in order to help solve the problem of terrorism. Our relationship with law enforcement will be better and I think that’s very important to both sides. But for police officers to reach out to them and learn about them in places like the Da’wah is a step in the opposite direction – a positive direction, not a hateful one.